Now is a great time to save big on the world's most comfortable recliners. Unwind brings you the lowest prices allowed on all Stressless Recliners. Choose your favorite leather grade, pick one of the fabulous colors, and match it perfectly with a wide assortment of different wood options in your preferred size. How about adding a functional accessory? These include: the ultra-convenient Personal/Laptop Table, the useful Ellipse Table, the stylish Urban Table, or the fan-favorite Elevator Ring set. Enjoy Fast, Worry-free Delivery on a Stressless Magic Recliner Small with Ottoman. Choose between a variety of leather colors and a wide assortment of different wood options. Start relaxing in your beautiful new Magic small recliner sooner with our Quick and Easy Shipping Methods. Looking to add a matching Stressless Sofa, Loveseat or Sectional? You’re in luck as the Ekornes Paloma Specials Sale Colors are also eligible for additional savings under this promotion. These deals can save you $1000’s. Simply choose your matching Paloma leather sofa or sectional model and watch the savings stack up! We invite you to check out the Paloma Specials for the Legend Series items. This will save you $1000’s. Simply choose a matching Paloma leather Legend sofa or sectional model and see the savings stack up! The Legend style series only provides a wood stain option when purchasing Legend Sector Arms (home theater seats only) and Legend Medium Corners (sectionals only). Our fast nationwide delivery means that we will bring your recliner, office chair, sofa or sectional into your home (or office), unpack it, set it up and take the box/packaging with us when we leave. Of course your furniture will arrive fully-assembled and ready to enjoy! Stressless Magic Recliner Small with Ottoman (small size- big on comfort). There's a small bit of magic in the air. The Small Stressless Magic Recliner by Ekornes has arrived, delivering exceptional lumbar, head, neck and leg support to our smaller-sized customers. The small Stressless Magic was designed to be one of the most comfortable Stressless recliners ever built. We must admit, relaxing in the Small Stressless Magic does tend to put us in a type of "soothing spell." Is it the legendary back and neck support? The well-padded leg cushioning? Or is it the near-perfect reclining motion that makes it so comfortable? 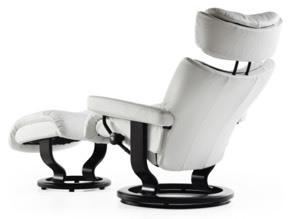 We give the small Stressless Magic a standing relaxation-ovation. The Magic Recliners not only have a size to fit almost any body type perfectly but they are also designed to require the most minimal of footprints. Check out these measurements and see which recliner size is best suited to be added to your home, rv, boat, or penthouse. Honestly, there is no limit to where you can add a Stressless Recliner and Ottoman. They fit comfortably in every type of decor and sit just as comfortably. Like its magical larger brothers (the Stressless Magic Recliner- Large and the Magic Medium recliner) the Small Stressless Magic is produced by Ekornes in Norway and was introduced to the Stressless Recliner lineup in 2012. Once you sit down and let your body sink into the extremely soft cushioning, you'll know that you've reached a level of comfort you could previously only imagine. The Small Stressless Magic is truly one of the most comfortable recliners ever designed by Ekornes. Want to see informative Ekornes Magic videos? Visit our Stressless Magic video channel on YouTube. Or Search and watch 100's of Stressless recliner videos at The Unwind Company YouTube site here. 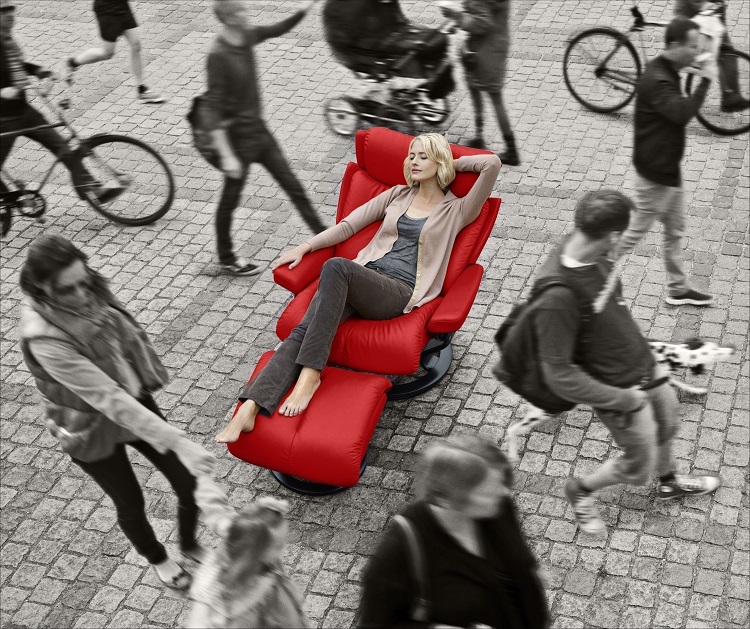 The Small Stressless Magic also looks as great as it feels. When you sit down, prop-up your feet and place your arms on the sloped armrests, you're sure to experience true Norwegian comfort. It's easily overlooked that the Small Ekornes Magic Recliner brings home the same back and neck-saving features that all Stressless Recliners and sofas are famous for throughout the world! This Small Recliner offers great comfort and support- especially to those who are of smaller build. We invite you to grab a book, kick-up your feet and sit in the Small Stressless Magic for a spell- You'll be glad you did- we guarantee it! Are you interested in financing your purchase? We have great news. We currently offer financing opportunities to suit your needs. Choose a financing option that will suit your budget and help get you the comfort you need. - The Patented Plus System which provides continuous support for your head, neck and lower back. - With the Stressless Glide System, you can automatically shift to any seating position by simply using your body weight. Prefer more or less reclining tension? No problem, simply grab the glide wheel knobs and give them a twist. Typically once these are set, there is no need for further adjustment in the future unless someone else is sitting in the recliner with different comfort preferences. If this happens often, you might want to consider getting your spouse their own Stressless recliner. After all, a comfortable couple is a happy couple. - The matching leg ottoman features a built-in tilt system that adjusts to your body movements for the ultimate in comfort. You can't help but notice the extra thick layer of cushioning on the Stressless Magic recliner ottoman. The ottoman also doubles as a soft, separate stool by flipping it upside down and locking the 4 plastic clips. With this much padding on the ottoman, it really does a great job as an independent stool. - All Stressless Recliners and Accessories are built to last for many years. The unique, round wooden base insures stability and is extremely durable. -Stressless Recliners are always created for a custom fit- Many Stressless recliners come in three sizes (small, medium or large) and many sofas are available in two sizes (medium or large). 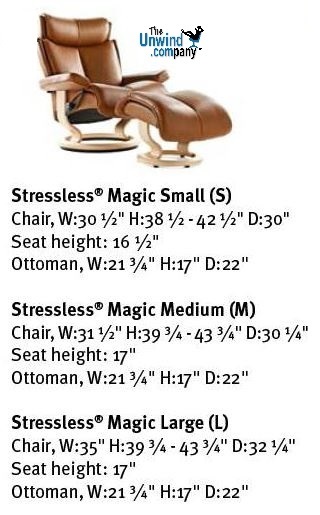 The Small Magic Recliner is comparable to the smaller versions of other Stressless recliner lines (Ekornes Stressless Chelsea, Stressless Tampa, Stressless Vision etc). 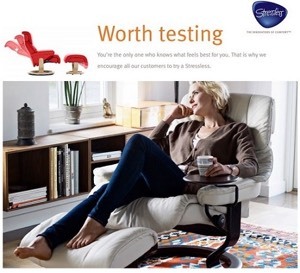 The Ekornes Magic Recliners (small, medium and large) share the same attributes. For best results, take a seat and let us help you determine which size will ultimately offer the most comfort and correct support for your individual body size and weight. We are also able to assist you over the phone if you're too far away to visit. We have Magic recliners in stock in multiple locations which allows us the ability to ship your recliner extremely fast and have it delivered quickly from coast to coast. Please call 1-888-486-9463 and you can be enjoying your Stressless recliner much faster than you ever imagined. The Unwind Company maintains an A+ Rating with the Better Business Bureau, with millions served. May we assist you as well? We'll always do our very best to get you taken care of- We guarantee it! We offer many full-service delivery options. A stress-free shopping experience has been our #1 goal since 1997! It is no wonder that Ekornes Small Magic Recliners are Exclusively Endorsed by the American Chiropractic Association (the ACA). Come visit the Unwind Back & Body Store to experience the Small Stressless Magic Recliner for yourself. If you have already decided and are ready to order, simply call (888) 486-9463 to speak with one of our Customer Service Representatives. We will ship your chair fully-assembled and ready to enjoy. Please review our return policy prior to ordering or call 888-486-9463 (or 1-601-932-5111) for personal assistance. You may also email stressless@unwind.com anytime- 24 hours, 7 days a week. It has a wide variety or color options. This chair really supports my upper neck and back well, and reclines easily so I can fall asleep while reading in it. It also is very helpful to be able to change the effort it take to recline with the knob on the side of the chair. Love this very chair!! !